Back in July, I wrote about having a solar water heater installed. 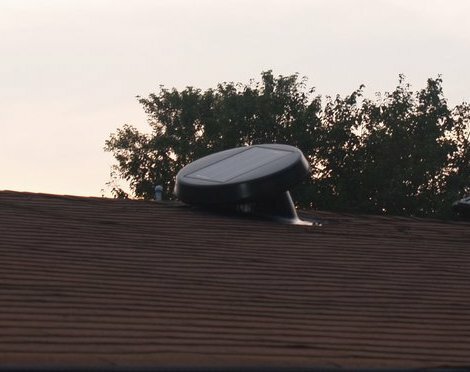 About the same time, I also had solar-powered attic vents installed by an outfit called The Energy Savings Store, and I wanted to document my experience with them for the benefit of anyone else that might be considering their services. Overall, I was not pleased. I arranged an initial site survey with them via email. Some critical information was left out of our exchange as I was not informed ahead of time that the survey by itself would cost me $350. Now, that money would have been applied to the cost of a photovoltaic (PV) system, had I chosen to purchase one, but since I decided not to, I essentially paid $350 for them to inspect my house and tell me things I already knew. Like I had air leaks around my exterior doors, and I could use some insulation in my basement and attic. Some people might find this information worth the money, but for me, it just felt like I had been scammed. Subsequently, I made the decision to install some kind of vent fans in my attic, and I thought I might be able to apply that $350 to the cost of the install and at least get something for my money. I should have asked about that in advance, however, because as it turns out, attic fans are not eligible for that discount. I elected to have two Solatube fans installed to replace my two existing ridge-mounted vents. A local handyman was hired to do the actual install, and he mistakenly removed the vent above our hallway bathroom. This was a stupid mistake and with a little more attention to detail it could have been avoided. But to make things worse, he did a terrible job of resealing around the vent when he put it back, so a week later when the remnants of Hurricane Ike blew through the midwest, it was raining in our bathroom, causing moderate damage to our bathroom ceiling. At roughly the same time, I noticed one of the two fans they installed was no longer working. To their credit, they responded quickly to my report of the leak and fixed it the next day, and a replacement for the faulty fan was ordered and installed within a couple of weeks. But these issues did little to improve my initial feeling about the company, and my overall first impression of them is not good. The entire episode cost me well over a thousand dollars and my bathroom ceiling still isn’t fixed. I would not recommend anyone use The Energy Savings Store.